The American Dental Association (ADA) recognizes nine specialties in dentistry. The ADA has identified scopes of practice for these specialties as well as educational requirements. An endodontist is a dentist who has fulfilled the ADA requirements in the specialty of endodontics. "Endodondia" literally means "inside the tooth." 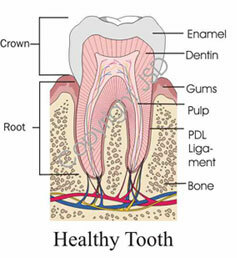 Thus, endodontists treat diseases of the roots of teeth and tissues related there-to. The primary purpose of endodontics is to save teeth that would otherwise need to be extracted. A question of primary concern to patients relates to this purpose: "How long will I be able to keep my tooth?" It is difficult to say how long a tooth will last since every tooth is unique and has it's own particular challenges. Some will suggest that endodontic treatment will allow you to retain the natural tooth for a lifetime. Unfortunately, such optimism is not borne out in the scientific literature. However, given the right set of conditions, many teeth can be preserved in the dentition for decades. Dr. Weed does his best to discuss all aspects of treatment with his patients, including challenges and any worries he may have. He generally won't take on a case if he doesn't think it will last at least 5 years. Dr. Weed strongly believes in personally spending as much time as necessary with each one of his patients in a pre-treatment consultation to gather information and to discuss diagnoses, treatment plans, and treatment prognoses. The importance of involving patients this way in their own treatments cannot be overstated. What is a Root Canal? and What happens during Root Canal Treatment? Your teeth formed within your jawbone when you were a child. As the teeth and roots matured they erupted in their particular sequence into your mouth and became functioning members of a rather complex masticatory apparatus. As teeth form within the jawbone they require a large transport system to ensure adequate supplies of calcium, phosphate, proteins and other building blocks for the developing tooth. Blood is the body's transport system. Blood vessels and nerves become encased in the growing tooth and form a tissue called "pulp." This pulp tissue serves to warn us of extreme temperature changes to our teeth, cavities forming, and other injuries to the tooth. The pulp even has the ability to heal when injured. Typically, a tooth that has not been injured in some way will contain a healthy, vital pulp (with a blood supply) for a lifetime. 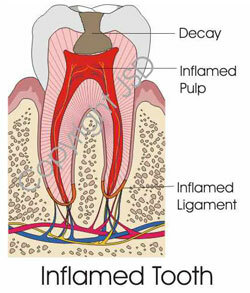 However, severe injuries or accumulation of various smaller injuries to a tooth can injure the pulp tissue. These injuries can cause the pulp to become chronically inflamed or even die and abscess. This is known as endodontic disease. Root canal treatments are aimed at removing this disease and returning the tooth back to normal function. If it is determined that you have a root canal problem and if the tooth is determined to be structurally and strategically worth saving, a root canal procedure is warranted. Almost all root canals are done under local anesthetic. Dr. Weed uses double strength anesthetics as well as the latest techniques to ensure a comfortable experience. The tooth is isolated with a dental dam prior to treatment. This is akin to "draping the patient" in a surgery when a patient is under general anesthesia. The dam serves to minimize inoculation of bacteria from outside the tooth during the procedure as well as to protect the patient from anything entering the mouth that should not be there. The tooth is cleaned and defective fillings and decay are completely removed. This is critical to making one final judgment on the suitability of the tooth for long-term retention in the mouth. The canals in the roots are located and cleaned. They are then sealed with a cement and usually a rubber material called gutta percha. One of the most important parts of root canal treatment is the repair of the damage the crown of the tooth has sustained. This is called a "build up" and will ensure the root canals are well protected. Since the purpose of this treatment is to allow the patient to keep his or her tooth, Dr. Weed believes in an individualized approach to treatment for each patient and each scenario. There are, of course, no guarantees, especially in medical procedures. However, we do our best to be selective in the teeth we treat, thereby increasing the chances for success. Teeth which can be treated in ideal circumstances have a success rate up to ninety percent! We will discuss with you the chances of success before any endodontic procedure to help you make an informed decision. If a root canal or endodontic therapy is unsuccessful or fails, you still have options. Very often, pain within the mouth and surrounding face is complex. Consequently, it is very important to identify the source of a patient's pain to ensure the correct treatment is delivered. Don't be surprised if you find out that your pain is not a root canal problem. About 10% of patients referred to our office end up not needing root canals. One of the most complicating factors we run into is non-tooth pain. Sometimes, while it might seem that a tooth is the source of a patient's pain, either the muscles or nerves of the face, head or neck are the true source. These are difficult cases for both the patient and the doctor. This type of pain is sometimes precipitated by stress. Dr. Weed will always take whatever time is necessary to get to the bottom of his patients' problems, even in these types of difficult cases. Dr. Weed is an expert in dental trauma. Teeth that have been injured because of trauma can cause problems for patients, even many years down the road. Dr. Weed is adamant about following up with his trauma patients for as long as possible. If a tooth has been knocked out of place, or out of the mouth completely, Weed Endodontics is the place to go. Sometimes, teeth which have been concussed, chipped, even if not displaced, can cause problems. Teeth that have turned a darker color than their neighboring teeth usually have sustained earlier trauma. Dr. Weed also specialized in bleaching teeth of this kind. In some cases, dark teeth can be bleached without needing to do a root canal prodcedure. Once endodontic therapy is completed your tooth should be examined periodically, usually 6 - 12 months after treatment completion and thereafter every few years. This allows us to make sure the tooth has healed or is healing properly. We will call you when it is time for a follow-up appointment. There is no charge for this follow-up. Dr. Weed likes to follow his cases for as long as possible. Nothing would make him happier than to see you 20 years after your treatment! Dr. Weed is an expert in root canal revisions. He is the author of a textbook chapter on this subject. If you have already had a root canal treatment and it is determined that it is failing, Dr Weed will determine the reason it is failing and also whether revision of the treatment is appropriate.